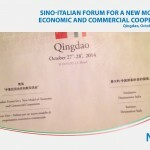 During the Sino-Italian Forum for a New Model of Economic and Commercial Cooperation held in Qingdao on October 27th 2014 and successfully organized by the Embassy of Italy to the People’s Republic of China the audience attended the official launch of the Sino-Italian Aerospace Platform (S-IAP), promoted by the Italian Aerospace Network (IAN). H.E. Ambassador of Italy Mr. Alberto Bradanini opened the Sino-Italian Forum announcing that Italy and China face the common task of achieving innovative, inclusive and sustainable development. Policies and solutions addressing the urbanization challenge, protecting the environment, modernizing the agriculture and healthcare systems are high on the two countries’ agendas. According to the Vice-Mayor of Qingdao Mr. Liu Mingjun, business resources in both Italy and China should be leveraged to promote advanced technologies, collaboration, and sustainable development in the sectors mentioned by H.E. Alberto Bradanini. The partnership should provide a vehicle for companies to work together with the two governments to facilitate technical cooperation and identify and address new market opportunities. Finally, the Secretary General of the Italian Aerospace Network Mr. Riccardo Coli presented the Sino-Italian Aerospace Platform (S-IAP): “Through the S-IAP, the Sino-Italian Aerospace Platform, our two Countries can share their knowledge in this strategic field which is growing exponentially, especially in China. This mutual interchange and cooperation between these two countries can be important, not only to strengthen bilateral relations, but also to balancing the trade exchange between Italy and China. He concluded by inviting the local Chinese institutions and enterprises from Qingdao and other major Chinese cities to join the Sino-Italian Aerospace Platform and to visit the Italian Aerospace Network during the China AirShow in Zhuhai.